I wrote the following poem during some time away recently. 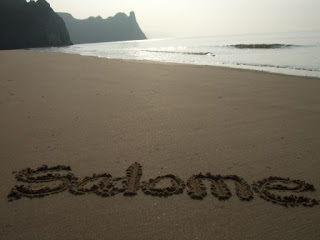 I dedicate it to our precious daughter Salome who lived 27/1/10 - 30/1/10. The photo is from my mate Nick who took this on a Wales beachside. This is the father's touch. To affirm a new life. To seek rousing fun and connection. To look and behold new form. The skin, the will to live. And I will guide you some of the way. That you did not last beyond a few days. The washes and the cuddles. That your mother's desire goes untended. That my love grows still.